Thank you to each and every parent, teacher and child who makes our amazing garden possible. Enjoy reading details about how and why our garden came into existence. BY JULIE BAWDEN-DAVIS / CONTRIBUTING WRITER Published: March 7, 2014 Updated: 8:46 a.m. 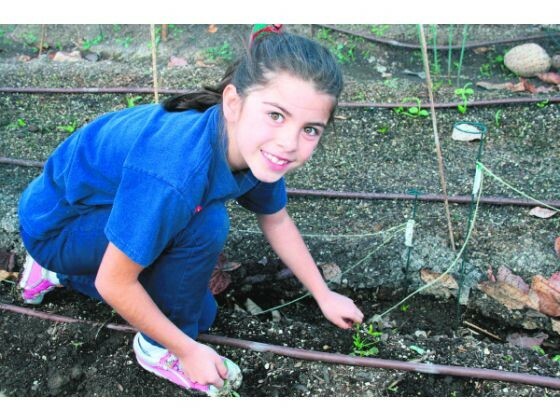 When Ava Mora pulled a purple and orange carrot out of Tustin Memorial Academy Elementary School’s garden recently and viewed the results of the seeds she and other students planted weeks before, the second-grader couldn’t wait to takea bite. While these are welcome words for the 150 parents involved in the TMA Organic Garden and Nature Center, which broke ground in 2008 and is the most extensive school garden in Orange County – involving all 700 of the school’s students – it’s the reactions from older kids that really make those parents smile. That fifth-and sixth-graders would know more about storm water runoff,composting and the nutritional impact of homegrown organic produce than the average adult was the goal of the school garden’s creator and co-chair, Marci Maietta Weinberg, who with the help of other parents and a University of California Cooperative Extension (UCCE) Master Gardener, started what has proven to be a sustainable school garden model. “My hope was for children to walk away feeling a responsibility as stewards of the planet and with a strong understanding of how what they eat affects themselves and our world,” Weinberg says. The methods used by the TMA garden dovetail nicely with the Common Core Standards now used in classrooms. TMA first-grade teacher Megan Caporicci formerly taught fourth grade, which is responsible for the school’s hot composting.”My fourth-grade class would go out and collect temperature data from the compost bins and then input the information in a table format, which taught them math skills in a relevant, hands-on way,” Caporicci says. UCCE Master Gardener Teena Spindler regularly consults throughout the county on school gardens and does site visits for schools interested in starting their own gardens. She has been involved in the TMA school garden since its inception. Students participate in seeding, transplanting, harvesting and garden maintenance and composting. Vegetables and fruits are sold at an after-school produce stand on Tuesdays. Ty Hall is regional manager of Kellogg Garden Products, which regularly donates soil, amendments and organic fertilizer to the garden. “Kellogg’s is coming up on 90 years in the horticultural industry, and it’s part of our business model to reach and teach the next generation, so we make contributions to select schools that are educating about gardening in a sustainable way,” Hall says. One of the main reasons that the TMA garden program works so well is the high percentage of parent participation. Each classroom has three to four Garden Master parents, who experience twice yearly training by Spindler and fellow Master Gardener Joanne Byrd. These Garden Master parents specialize in one of three areas: planting, maintaining or exploring. Parents often will tie in what the kids are doing and seeing in the garden with what’s being learned in the classroom, says Garden Master and planting co-chair Ellen Kinoshita, whose child Samantha is in fifth grade while Cassidy attends third grade at TMA. “The garden provides an excellent extension of the classroom, and the kids love getting in the dirt and examining the worms and insects,” she says. Another major goal is developing healthy eaters. The kids are given Green Bucks when they show engaged, enthusiastic and extra hard-working behavior in the garden. These are used to purchase the healthy items available at the sales on Tuesdays. The Green Bucks program was made possible by a grant from Slow Food Orange County. The garden also currently is piloting a garden game that involves bringing a plate out to the garden that has been properly proportioned with the amounts of certain types of foods that should be eaten in a meal and playing cards representing foods like greens. The kids look through the garden for items on the cards and then fill their plates with the appropriate cards. Mora, the second-grader who enjoyed her first homegrown carrot, recently solved such a problem with her class.